Registration fees include a competition fishing hat, BBQ after the event, and fishing licenses. In addition, each team will receive an official competition fish tape measure, fish keep bucket, and scorecard. Person who catches the most fish species. Minimum of 4 species to be eligible. Maximum 4 lines in the water at one time, one hook per rod. This year, for logistical reasons, we are accepting a maximum number of 20 teams. There is no minimum or maximum number of people per team, as long as all members are registered (and personal safety is considered). However, there can only ever be 4 lines in the water, whatever the size of the team. All members need to be registered before the competition starts (see registration and payment information section below). All boats need to be kitted with lifejackets (for every passenger) and paddles. Please do not overload boats or mess with the hippo or crocodiles. Sun cream, sunglasses, hats and umbrellas for shade are highly recommended. Teams and participants are responsible for their own safety – please keep an eye on the weather / wind and take suitable precautions to ensure your safety. 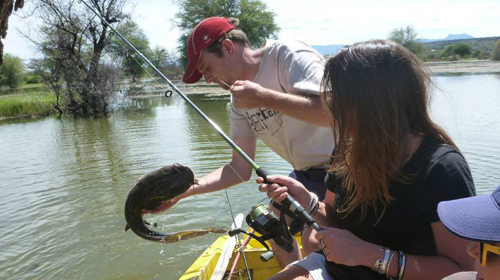 All fish must be caught by registered team members using rod and line (strictly no nets allowed). 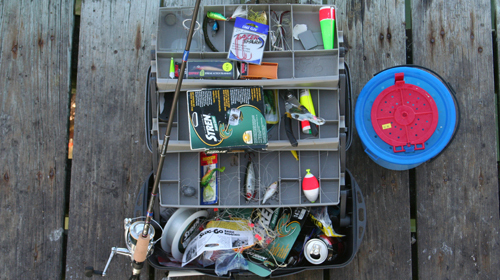 Bait, artificial lures, and flies can all be used. 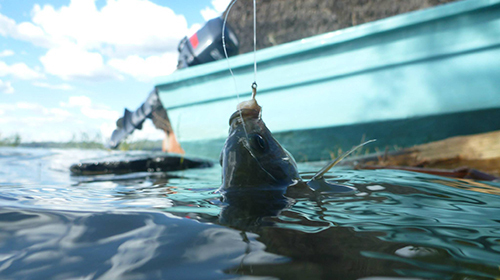 Every effort should be taken to release fish – photographic evidence will be used to verify your catch. Any lungfish and/or large catfish should be kept alive (each team will be provided with a basin) until the weigh in after which they should be released back in to the lake. Any fish which cannot be released will be donated to the Kampi Ya Samaki community. Only one photo per fish will be accepted. Please delete any repeat or unwanted photos from your camera before submitting your photos. Fish below the following sizes should not be logged on the Team Score Sheet – no points will be awarded (see notes on Individual Prize and Highly Prized Accolades below). All “competition size fish” need to be fully recorded on the team score sheet as well as photographed using a time stamp regardless whether they are kept or released. Each competing team will receive an official tape measure to use during the tournament – please ensure the tape measure and both ends of the fish are clearly visible in submitted photos. The final team score will be determined by adding all the points together at the end of the day, and multiplying this total by the total weight of the catch. 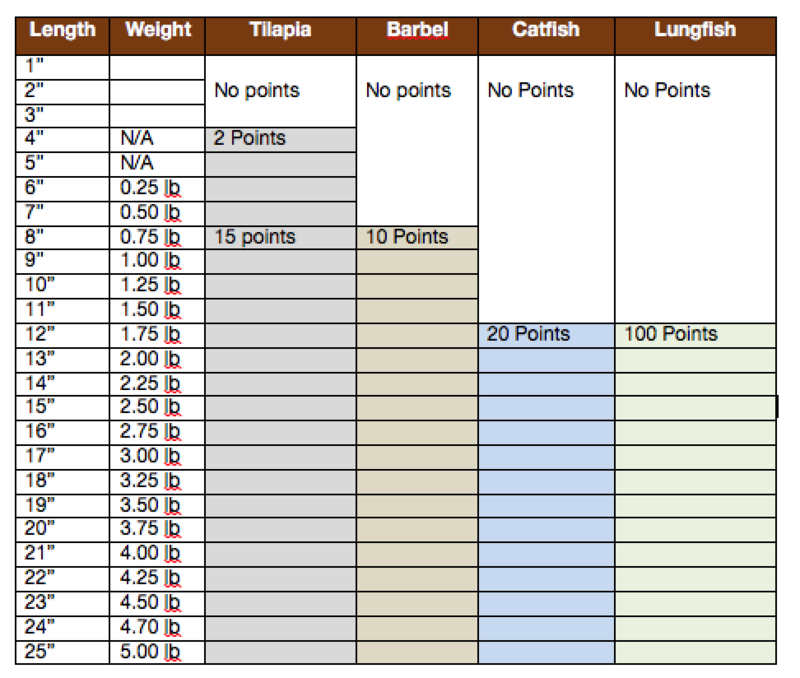 The weight of each fish will be calculated using the recorded length of each fish (see Fish Calculation Chart – attached). All competition size fish need to be fully recorded on the team score sheet as well as photographed using a time stamp. Please document the following on the Individual prize score sheet. Fish that are applicable to one or more prize category should be recorded on all relevant score sheets. Largest Fish = Angler who catches the heaviest fish of the day. Most Species = Angler who catches the most species of fish. If two or more anglers have the same number of species, the total weight of the fish submitted for this prize becomes the tiebreaker. Please note that fish that are too small to qualify for the Team Scoring can be submitted for the “Most Species” category. All submissions need to be recorded on the Highly Prized Accolades Score Sheet. Smallest Fish = Angler who catches the smallest fish using hook and line. A matchstick will be provided to measure the fish should the tape measure not suffice. Photo evidence required. Fish Face Selfie = Best impersonation of your caught fish. Photo evidence required. Weather permitting, the tournament will last 9.0 hours, starting and ending at Roberts Camp: the competition starts promptly at 7:00 AM (teams requested to collect their registration packs the day before at Roberts Camp between 3:00pm and 5:00pm on Friday April 19th) and boats need to be back onshore for the ‘weigh in’ by 4:00PM. Teams are free to start after 7am or end early and/or take breaks in between. If the weather does not allow for the full 9.0 hours of fishing, the organising committee will declare an earlier end time. All teams will need a working phone on board so that any such changes can be communicated. Cheating or breaking of any of the official competition rules will result in immediate disqualification from the tournament. In addition there will be an expectation that you pick up the tab for a full round for all competitors at the Thirsty Goat bar. Neither the organizing committee of the Baringo Fishing Competition nor any hotel / lodge or accommodation venue take any responsibility for any loss or damage to equipment and / or any bodily harm or injury that may occur during the duration of the competition. All Competitors will have to bring their own fishing rods, tackle and bait to Baringo. All the campsites and lodges listed offer secure parking. Boats can be launched from the Island Camp Jetty or Roberts Campsite. There are approximately 15 boats (max 8 ppl per boat) available for hire in Kampi Ya Samaki. In light of the tournament, we have let the community know that all boats need to be fitted with life jackets. A special tournament rate has been negotiated of 7000ksh per boat for the full day. Hiring boats is one of the many ways you can support the Kampi Ya Samaki community during the tournament. If you would like to hire a boat, please make sure to indicate this on the registration form. What is the best fishing method? What if I want to compete but I do not have a team? 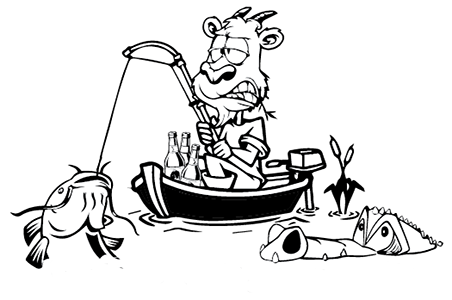 There are many fishing methods that work well in Baringo. As the water tends to be silty with poor visibility, bait always works well. Locals use flying termites and dragon flies. Any meat scraps should work well for Barbel and Tilapia. Lungfish seem to prefer dead fish while Catfish will attack almost anything including scented soap. For the purists amongst us, fly fishing for barbel and tilapia has brought results, as has spinning in the shallows… but, as is always the case with fishing, everyone has their own fishing technique, bait theory and that magic spot that can’t fail. We cant wait to hear what worked for you! If you want to participate in this year’s competition but are not part of a team, please make sure to register for the competition through the online form. On the day, you will be able to join a team and/or form you own team of “lonely fishermen”. Don’t forget your hooks, rods, and bait! Each participant will receive an official super-stylish fishing hat but please remember to bring sunglasses, sunscreen and umbrellas to provide extra shade. Whilst out fishing, please remember to bring & drink plenty of water. There will be BBQ buffet provided at the end of the competition, however, participants will need to organise their own breakfast, lunch and other meals during their stay in Baringo. Roberts camp will be able to organise take away breakfasts, as will most of the other hotels. Lunch options can be arranged at many of the lodges and hotels for those that want to take a break from the fishing but arrangements need to made in advance to avoid disappointment.